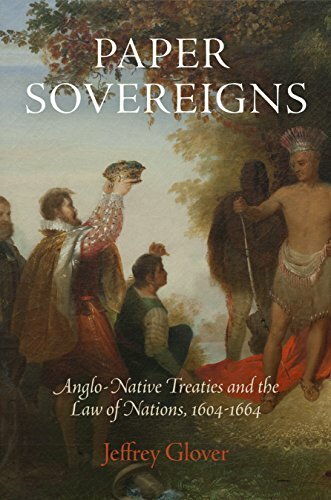 [PDF] Paper Sovereigns: Anglo-Native Treaties and the Law of Nations, 1604-1664 | Free eBooks Download - EBOOKEE! Posted on 2018-01-28, by luongquocchinh. Description: In many accounts of Native American history, treaties are synonymous with tragedy. From the beginnings of settlement, Europeans made and broke treaties, often exploiting Native American lack of alphabetic literacy to manipulate political negotiation. But while colonial dealings had devastating results for Native people, treaty making and breaking involved struggles more complex than any simple contest between invaders and victims. The early colonists were often compelled to negotiate on Indian terms, and treaties took a bewildering array of shapes ranging from rituals to gestures to pictographs. At the same time, Jeffrey Glover demonstrates, treaties were international events, scrutinized by faraway European audiences and framed against a background of English, Spanish, French, and Dutch imperial rivalries. To establish the meaning of their agreements, colonists and Natives adapted and invented many new kinds of political representation, combining rituals from tribal, national, and religious traditions. Drawing on an archive that includes written documents, printed books, orations, landscape markings, wampum beads, tally sticks, and other technologies of political accounting, Glover examines the powerful influence of treaty making along the vibrant and multicultural Atlantic coast of the seventeenth century. No comments for "[PDF] Paper Sovereigns: Anglo-Native Treaties and the Law of Nations, 1604-1664".